Why is it that as pop and rock singers grow old, many of them turn to Jazz and Swing music? I don’t know, but I know that most of them should have stayed away as they can’t handle it. I therefore hesitated buying sir Cliff`s new album, where he recorded a handful of tunes from before his own career started in 1958, but I must admit, he does it well. And why is that? Well first of all, Cliff doesn’t pretend that he’s a jazz singer or crooner, he delivers the 12 songs. 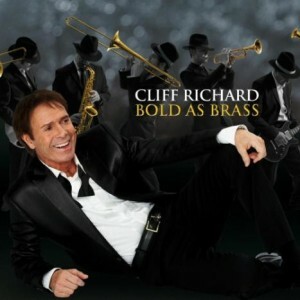 Bold As Brass also comes as a limited 2 CD edition containing 14 songs and another 2 on disc two, he sings as a pop artist with a twist of rock, and that is brilliant. Backing Cliff is the wonderful "Orchestra De Ville", guy’s that know how to play in the big swinging still, they are truly on home field, and the combination of them and Cliff works to perfection, because none of the two (ODV or Cliff) tries to be the star act on the album. You have to be bold when you pick up songs written by some of the heavy boys in the business like Cole Porter, Duke Ellington, George & Ira Gershwin etc. And yes there are a few songs that don’t suit Cliff`s voice, and I would advise those of you who buy this album, and like what you hear on it, to also buy the original artist who recorded the songs way back – singers like Frank Sinatra, Andy Williams, Dean Martin etc. 1. Love Me Or Leave Me (Kahn/Donaldson). Nice opening of the album. 2. Lazy River (Arodin/Carmichael). Classic Baber shop song, now in a jazz version. 3. I’ve Got You Under My Skin (Cole Porter). A classic, best with Frank Sinatra. 4. I Just Want To Make Love To You (Willy Dixon). Cliff sounds almost like on the album Rock `N` Roll Juvenile from 1979. 5. They Can’t Take That Away From Me (George & Ira Gershwin). Cliff is the longest running act in the business, title for a new biography? 6. Lets Fall In Love (Cole Porter). A standard when it comes to crooning, but Cliff`s version is ok.
7. I Didn’t Know What Time It Was (Rodgers/Heart). It’s a lovely tune. 8. Accentuate The Positive (Arlen/Mercer). A bit weak in Cliff`s version. 9. Teach Me Tonight (Cahn/De Paul). Just simply nice. 10. Don’t Get Around Much Any More (Russell/Ellington). Pure Jazz. 11. Night And Day (Cole Porter) One of the top songs in Jazz music. Cliff version is weak when you like the tune as much as I do. 12. Bewitched Bothered And Bewildered (Rodgers/Hart). A difficult song to sing when you are not a jazz singer.